We have just returned from a trip out to the eastern end of Canada, specifically to the Gaspé peninsular that lies on the southern side of the St. Lawrence River in the province of Quebec. One of the things we did was spend time in the village of Percé, which is really just a tourist town, now that the fishery has declined and no longer provides a sufficient source of living for the inhabitants. 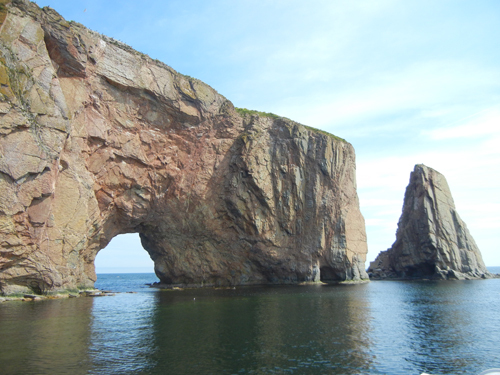 No trip here would be complete without a ride on a tour boat to see the famous Percé rock that stands like a beacon. There were numerous seabirds on the cliff tops, including two species of cormorant, and I did spot a single osprey. The southern-most rock outcrop used to form an arch with the rest of the structure, but time and erosion have taken their toll. The arch that you can see will also be eroded over time, but I doubt we shall see that! 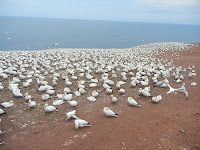 From the rock we sent round the southern side of the nearby Bonaventure Island to see that famous gannet colony. This is truly astonishing. 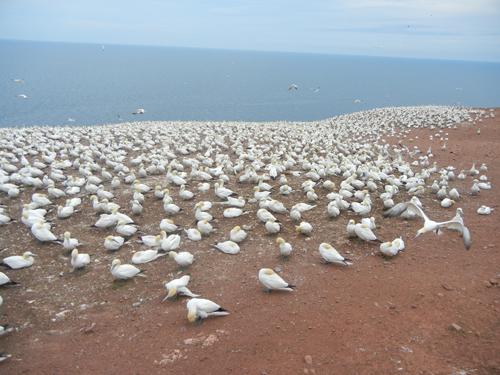 The guide told us that the colony contains something just short of 48,000 birds. 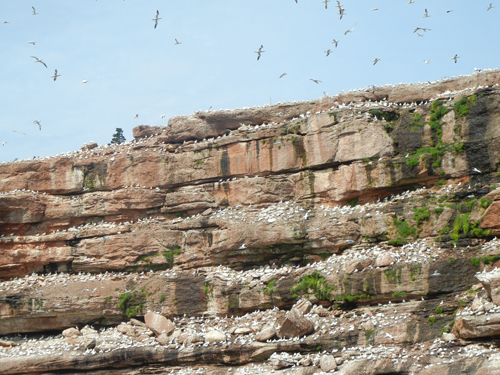 It is one of the two largest such colonies in the world and in this view we see a small part of that mass roosting on the cliffs. We also saw a bald eagle in a tree, several grey seals and a single whale, probably a minke whale, but it was too far off to make a sure identification. 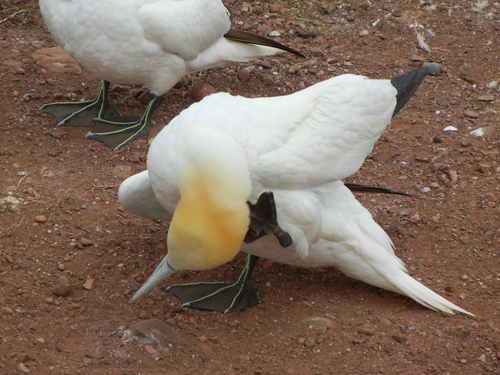 Back on the north side of the island, we disembarked to make the 2.6 km trek up the path and over the top to get close to the gannets. Now we really did see a mass of birds. The ropes that keep the public at bay were only about four metres from the nearest ones and we could see that the nests, mere mounds of mud with bits of dried vegetation in them were very close to one another. The young lady interpreter told us that they are precisely eighty centimetres apart. This bird was having a good scratch. One of the closest nests had a young bird in it, but the chick was pretty lethargic and showed little interest in food. A single adult sat close by, trying to spark youngster into some activity. During the thirty minutes or so that we were there no other adult showed up and we could see a few other nests, further away, with much larger chicks, many of them with lots of forming feathers. In this pic you can see that our subject was still mostly down-covered. This one has little or no chance of joining the southern migration to the Gulf of Mexico next month. 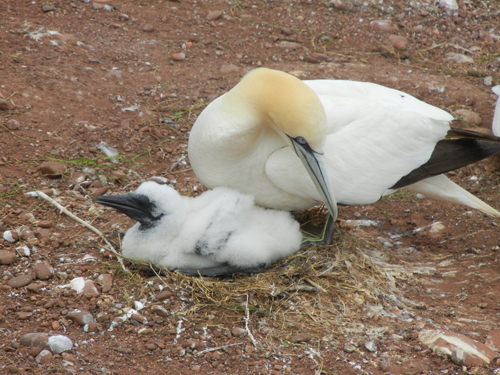 Another thing the interpreter told us was that about 40% of nesting pairs do not succeed in rearing their young. She would not admit to the clear observation that less than10% of the birds we could see across our front even had chicks in them. I quizzed her about the failure rate and asked if any research was being done on possible causes of mortality. I was particularly interested to learn if any necropsies on dead chicks had been carried out. The short answer? NO. I asked why and was more or less brushed off with “this is a natural system and we don’t like to interfere. She did admit that the population had been dwindling for a few years and we agreed that the decline might be due to a reduced food supply or possibly pollution in the Gulf of Mexico, This makes some sense, given the history of the BP oil spill of 2010. However, the lack of scientific curiosity in the Quebec ministry seems sad. I took a few still shots of what we saw and also ran my little Nikon video camera to watch some interactions. In this clip you can see two birds “necking” in the centre of the frame. This is not just a courting ritual – we were way past that stage of the annual cycle. According to the informative movie that one can see back on the mainland at the Percé interpretive centre, the birds do this routinely because they like it. About half way through the clip you will see a bird land at a nest (at the 3 o’\clock position) and at once seem to attack the one that it sitting on the nest by grabbing its neck. 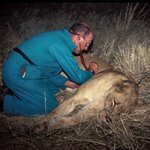 Apparently males do this routinely when they return to make sure that they have the right partner. The aggro quickly changes to the necking, so they must have recognized one another.